Earlier this year the folks that brought us IndieDB and ModDB launched SlideDB, a site dedicated to giving indie mobile game developers a means to reach players beyond showing up on the iTunes or Google Play top charts. 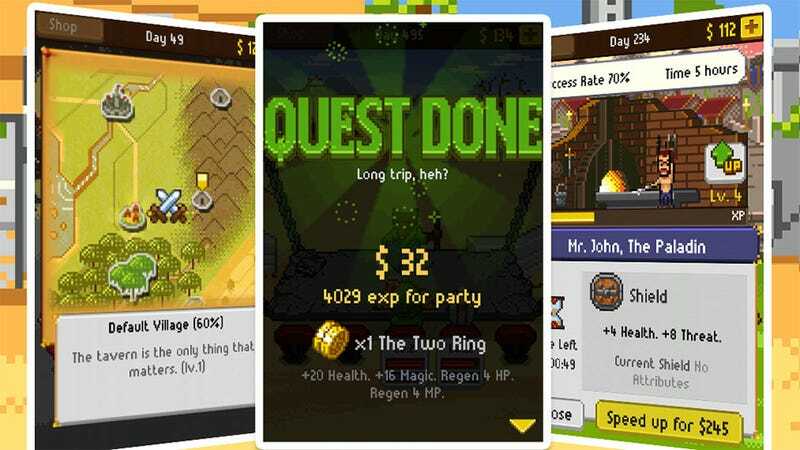 It's given attention to games that otherwise might have been lost in the crowd—games like Dream of Pixels and Knights of Pen & Paper, two of SlideDB's top five gaming apps of 2012. I single those two games out because I wouldn't have discovered them if not for SlideDB. Two of my favorite titles of the year, and I might have never played them. That makes me wonder how many other amazing games I've missed. I nearly missed out on Gua-Li-Ne. That would have been a tragedy. More than 4,000 votes were counted to come up with SlideDB's App of the Year and the rest of the top five. That might not seem like a lot in the grand scheme of things, but when you consider that number includes some of the best and brightest indie talent working in mobile gaming today those votes mean more than a million Angry Birds downloads. So check out the video, hit up the SlideDB App of the Year page, and go play five of the coolest games of 2012.